When Jim Rutherford took over the Penguins this past spring, the first major move he made was a draft day shocker. James Neal had been rumored to be on his way out of Pittsburgh before Rutherford even arrived in town, and he dealt the talented, but troubled, winger to Nashville for Patric Hornqvist and Nick Spaling. The trade was not initially well received by many due to a perceived lack of value and Spaling's inclusion in the trade. Those in favor argued that Hornqvist played a more complete game and would receive a similar scoring bump playing next to Malkin and Crosby. It will take years to full judge the trade, just as all other deals need time to assess their full impact. After all, no one would have predicted after the Hossa trade that it would have been notable for bringing Pascal Dupuis to Pittsburgh. However, we can take a look at the early returns and try to judge the trade as it looks so far. I've previously taken a look at the trade after the first quarter of the season, and now with the year reaching the halfway point I'll assess how the second quarter has gone for the three players involved. It was a rough quarter of the season for both stars involved in the trade. Each missed time with injury, and each saw his scoring rate dip from the first quarter, although Neal's was a much smaller decline (0.64 pts/gm in the 2Q vs 0.67 in the 1Q) than Hornqvist's (1.14 vs 0.42). A lack of powerplay scoring has surely taken its toll on those stats, as Neal (1g) and Hornqvist (1a) each had just a single power play point. I said it last time about Neal, but this time it applies to both players: they're unlikely to see the type of production with the man advantage continue. Hornqvist plays on one of the best power play units in the league and offers a great net front presence; Neal has a hard shot with a quick release that helped place him second in the league in power play goals during his time in Pittsburgh. Nick Spaling has managed to play in every game so far this year, and he's taken advantage of the injury situation in Pittsburgh, scoring 3 goals and 7 assists in 20 games during the second quarter, mostly playing somewhere in the top six. The 10 points he posted actually represents a higher scoring average (0.50 pts/gm) than Patric Hornqvist during the second quarter. Looking at the even strength stats, and both Neal and Hornqvist continue to be strong possession players with a large, positive relative Fenwick. They both continue to have a high PDO, though it looks like a good chunk of the regression from that number will be seen in the defensive end. The biggest difference is that Neal has continued to see a high percentage of his zone starts in the offensive zone while Hornqvist's have come down back closer to 50%. However, the numbers do paint a bit of a troubling picture for Pittsburgh. James Neal's second quarter has dragged his numbers down slightly, but he's still not far behind his previous three season's scoring in Pittsburgh (2.19 pts/60 vs 2.35) even while being separated from Evgeni Malkin and playing in a worse offensive environment. Furthermore, his even strength production in Nashville is well above what Patric Hornqvist was producing his previous three seasons there (1.87 pts/60). One of the arguments being made for this trade as it was announced on draft night was that Hornqvist would receive a bump in production similar to the one that James Neal saw joining the Penguins from Dallas. That was always a bit of a fallacious argument, as Neal was joining the team as a 23-year-old player entering his prime while Hornqvist became a Penguin at 27 and right in the middle of his prime. Either way, it was assumed that Hornqvist would see a boost in scoring playing with Malkin or Crosby, much like it was assumed that Neal would see his scoring plummet away from Pittsburgh. 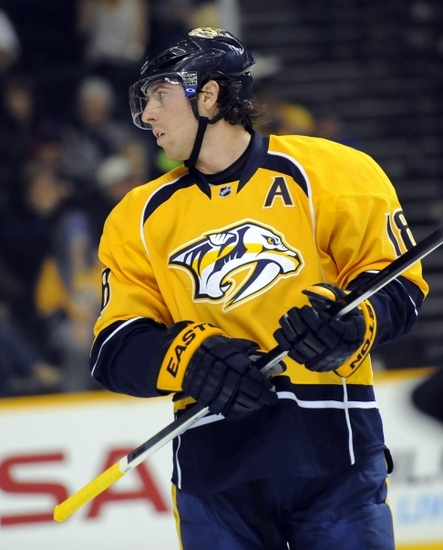 However, his scoring this season is below his scoring in Nashville (1.72 pts/60 vs 1.87) at the midpoint of the year. Even more troubling is the fact that he has virtually the same production at 5 on 5 as Nick Spaling (1.71 pts/60). While Spaling has been putting up better numbers in Pittsburgh, likely due to increased time in the top six due to injuries, it's still troubling that Hornqvist hasn't been able to outproduce him so far. Interestingly enough, Spaling has gone from being a negative possession player relatively worse than his teammates on a bad possession team in Nashville to being a positive possession player relatively better than his teammates on a better possession team in Pittsburgh. It remains to be seen whether that can continue, but it's still a nice surprise either way. As I said after the first quarter, both players were likely to see their scoring drop some, though Hornqvist has seen a larger decrease than Neal has. Neal's production in Nashville 5 on 5 is still well above Hornqvist's over the previous three seasons (2.19 pts/60 vs 1.87 pts/60), but Hornqvist's production in Pittsburgh is nowhere near Neal's during that same time frame (1.72 pts/60 vs 2.35). While I like Hornqvist as a player, it's becoming more clear what many said from the start: Jim Rutherford botched this trade. Hornqvist is a good player, but he's been one unable to match Neal's production in the early going - or come within the same ballpark. While Spaling has been more productive in Pittsburgh than he was in Nashville, he's still a role player that could've been filled during free agency instead of using equity during a trade. Jim Rutherford did just that this past offseason with Blake Comeau (2.15 pts/60 ES) and Steve Downie (2.22 pts/60 ES). As the season progresses, Spaling is likely to see his production decrease as resumes his role in the bottom six when the Pens get healthy, but hopefully he can continue being the solid possession player while retaining some of the scoring touch he's shown so far. It will be interesting to see how Hornqvist and Neal respond when they come back from injury, but at this point it doesn't look like we should see too much of a deviation from their track records over the previous three seasons. Rutherford rushed into this deal on draft night despite no draft picks changing hands without, allegedly, doing his due diligence on the trade market. Spaling wasn't then, and isn't now, the right complimentary piece in this trade. Rutherford took one of the best scoring wingers in the game during his time in Pittsburgh entering his prime at a great cap hit and only managed to get back a good player and a role player in exchange without saving any money in the process. In fact, he tacked on an additional $1.45 million AAV to make this deal. The prospect of Rutherford putting his mark on this team further in major deals is a frightening prospect, especially considering his track record of getting 5 of his 20 teams for Hartford/Carolina into the playoffs. David Poille got the best player and the best value in this trade. As things stand now, it's hard to argue it's not anything but a clear win for Nashville. I could not possibly disagree more with your ending analysis. I believe this analysis is accurate but as stated by the author, it is only an early assessment. I also felt that the pens organization could have got more in return for Neal. However, the Perron trade sure seems to offset the lose of the Neal trade, allowing Rutherford to not deal any top defensive prospects and setting the stage for another trade involving our currently wasted NHL ready prospects.